Last week was the first of two Mash Camps of the summer. The ages were 7-12, and we had an equal number of boys and girls. What really surprised me this year was how attentive this group was. Most young men and women at their age have trouble sitting through any presentation, and we were asking them to learn about goal setting, mindset, and nutrition. The parents kept sharing with the staff instances of their children asking them about proteins, carbs, and fats. This is the age we have to start people. Why do we feed our young kids so poorly, and then expect them to change their habits when they get older? Now is the time! Yes, we taught all the kids about speed, body weight strength, jumping, and agility, but nutrition, goal setting, and mindset are the difference makers for them in life. We reiterated all week that the most successful people in life become “Masters of the Mundane”. Everybody does the big things like train, sprint, and practice, but the big difference makers become the little things. Little things added up over time add up to be huge advantages for athletes! The athlete that eats well, sleeps well, has a plan, and believes that they can succeed will be the athlete that comes out on top every time. I believe this to be the hard one for parents to pass on because they didn’t master the small things, so they don’t know to pass it on. This was always my secret as an athlete! Genetics were never on my side per say, so I did all the little things well, and over time I was able to catch and pass up my competition. The camp was visited daily be current MashElite college athletes of various sports and genders, and they shared their journey. Each athlete is different and provides potential nuggets of knowledge that helped them in their quest for college glory. You never know what nugget of knowledge will stick with the young athlete through their high school experience helping them reach their goals as well. The next Mash Camp is June 15-19 for ages 12+, and it promises to be stacked with these same nuggets! For more information check us out at www.MashElitePerformance.com and you can read more about the camp in the “Events” section and sign up in the “Store” section. This weekend while at the Olympic Weightlifting Youth National (write up to come tomorrow) a coach asked me how I was so successful in the private athlete strength and conditioning sector because he had been in business for two years and was struggling to get things off the ground. I explained that first you need to love the kids. If you don’t, do something else. What I do is a lot of work! I am writing this blog at 6am, and I could be in bed, but I wanted to share this information with all of my MashEliters. Second you need to live the life that you are preaching. If you are telling your kids to train hard, eat right, set goals, have a winning mindset, love God, and love their family, then you better do the same things! Period! Kids can see through a fake man! Last get RESULTS! If you don’t know how to get results for your athletes, then either learn how to do so or Quit! 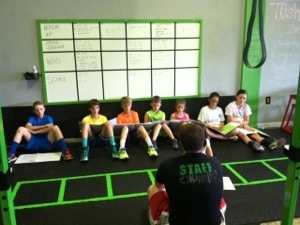 I have studied my whole life to be able to provide my athletes with an environment of success. I continue to study, and now I have surrounded myself with a staff that has the same desires of knowledge. My staff loves the kids (young and not so young kids) just like I love them. These are the keys! Nothing fancy! Just character, love, and knowledge!